Liquidators' homes safe despite Queensland court elevating environment's rights above those of workers and insolvency practitioners. Insolvency practitioners: extra caution required in the state of Queensland. Herbert Smith Freehills partner Peter Smith: Liquidators’ homes safe for now. Less than three weeks after a judge of the Queensland Supreme Court elevated the environment’s rights in liquidation above those of liquidators and employees, the lawyer who helped bring about this ominous reordering has assured liquidators their homes are safe, though they might be wise to assume such assurances adhere best to dwellings built of approved mud bricks, earth reverently rammed and only authorised recyclables. 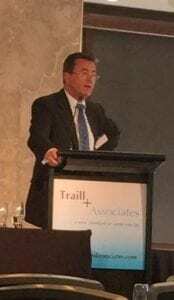 The assurance came during day one of the 16th Traill & Associates Annual Practical Insolvency Conference. 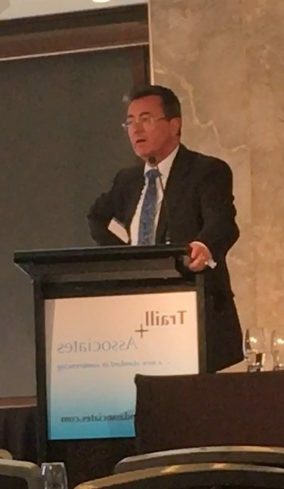 Herbert Smith Freehills partner Peter Smith had the floor, he was explaining the background to the decision of Justice David J Jackson in Linc Energy Ltd (in Liq)  QSC 53 (13 April 2017) and, having frozen the spine of every registered liquidator in the room with his offhand assessment of the judgment’s fearsome implications, sought to keep his audience enthralled by dangling a bone. “They are not expecting practitioners to go and mortgage their homes,” Smith said, referring to Queensland’s Department of Environment and Heritage Protection (DEHP). It is worth noting that PPB Advisory’s Stephen Longley, Grant Sparks and Martin Ford, who were appointed voluntary administrators of Linc Energy on Friday, April 15 2016, haven’t resigned. But given what’s transpired since their appointment, it’s probably crossed their minds, perhaps even as soon as Monday, April 18, 2016 when the Queensland Government announced a statewide ban on underground coal gasification (UCG), the process being trialled by Linc at Chinchilla? That would’ve done wonders for any sale campaign. Or perhaps the following month, when the liquidators were issued with an environmental protection order (EPOs) relating to the contamination? Smith however was keen to give conference delegates hope. He said the DEHP was well aware that the implications of Justice Jackson’s judgment for the insolvency profession also held potential ramifications for the state if liquidators concluded that a job had no assets over which they could legally assert their lien for remuneration. “While a court has an obligation to appoint someone else, it needs a consent,” Smith said, adding that if a liquidator resigned because the job’s environmental obligations were likely to swallow his or her fees, there was not much chance anyone else would agree to take it on. At present it’s unknown whether the liquidators will appeal. That is likely up to Henry Carr, who heads the recovery unit operating within the Federal Department of Employment’s Fair Entitlements Guarantee (FEG) scheme, which Smith revealed had bankrolled Linc’s application. 2 Comments on "Liquidators: homes safe from enviro-liability"
The real problem with an appeal is that the underlying application was only for directions and nothing substantial. Also The trial judge appears to have “ducked” the serious issues that needed clarification – all of which apply in the other states and have done for many years – no doubt in vein hope that they would go away. Linc Energy would think that workplace health and safety laws would have to be looked at just because the company has no money A \’person conducting a business or undertaking\’ (PCBU) would still have some responsibility and would have to be replaced with a suitable person qualified to keep the work site safe and not a Liquidator making decisions.